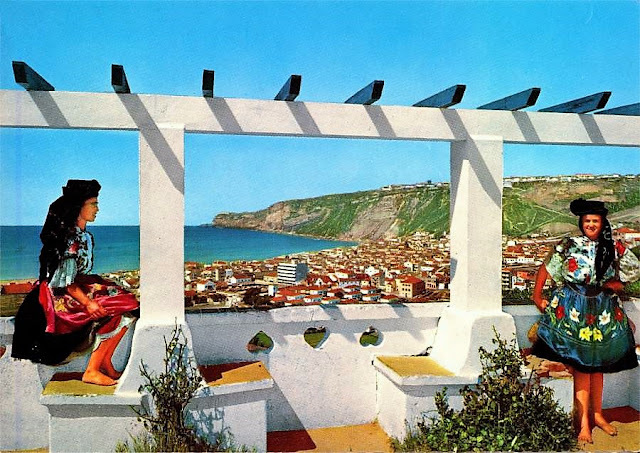 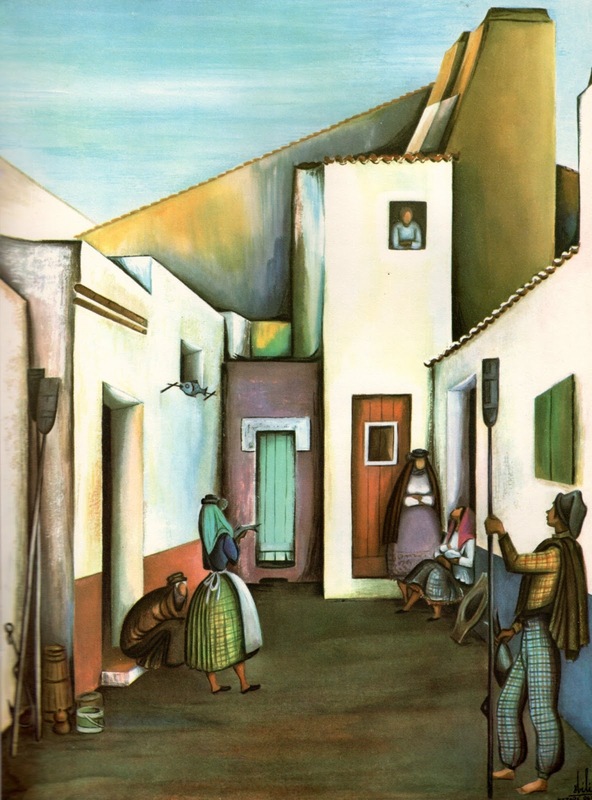 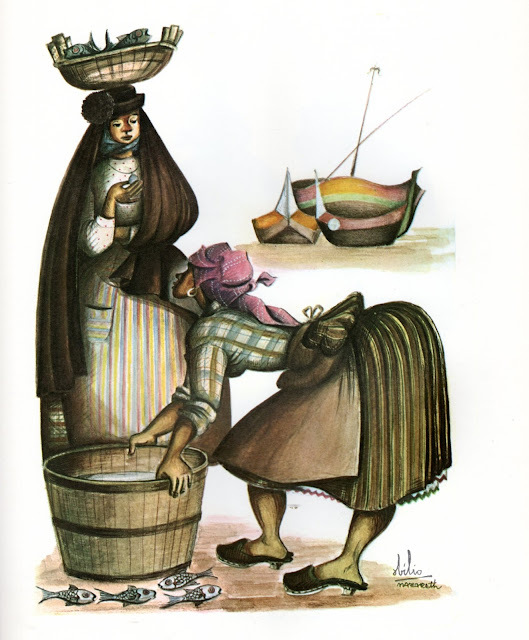 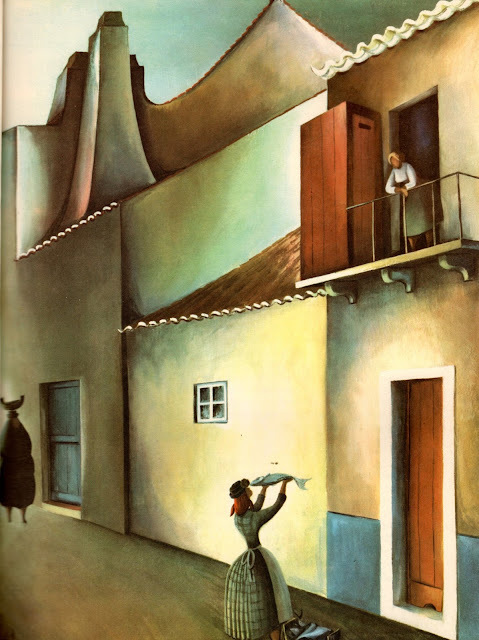 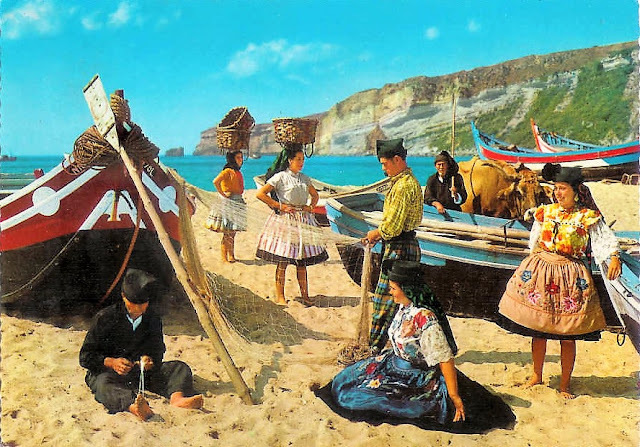 I received a request to do some more research into Portugal, in particular the province of Estremadura [not to be confused with the Spanish province of the same name]. 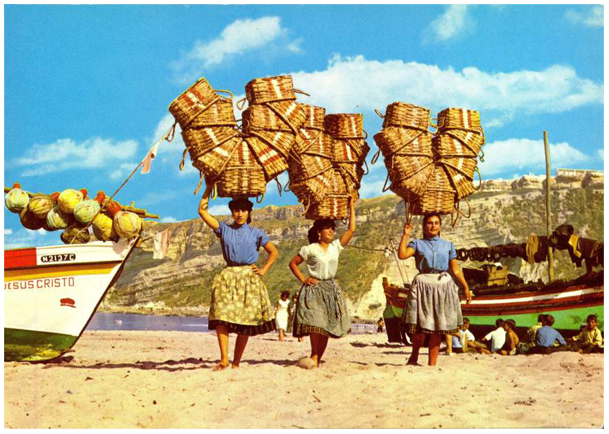 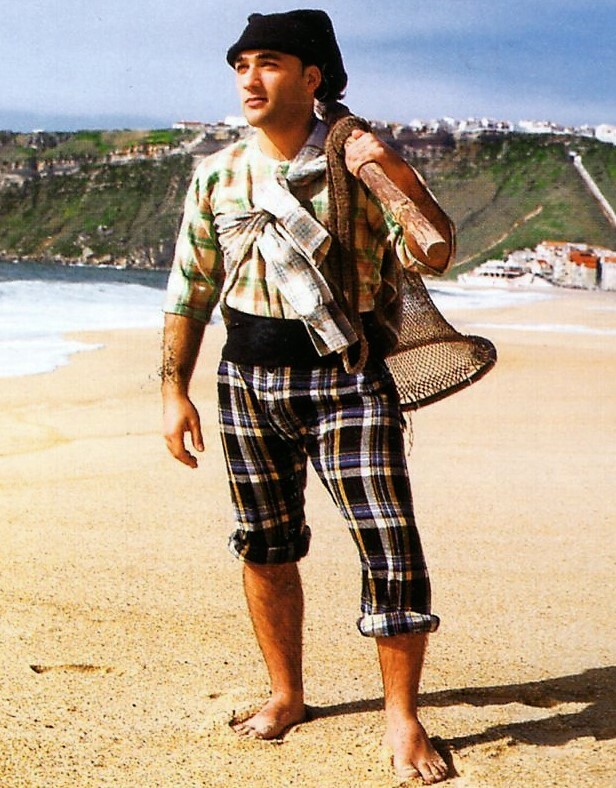 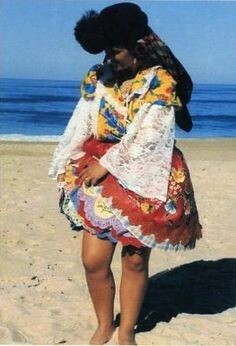 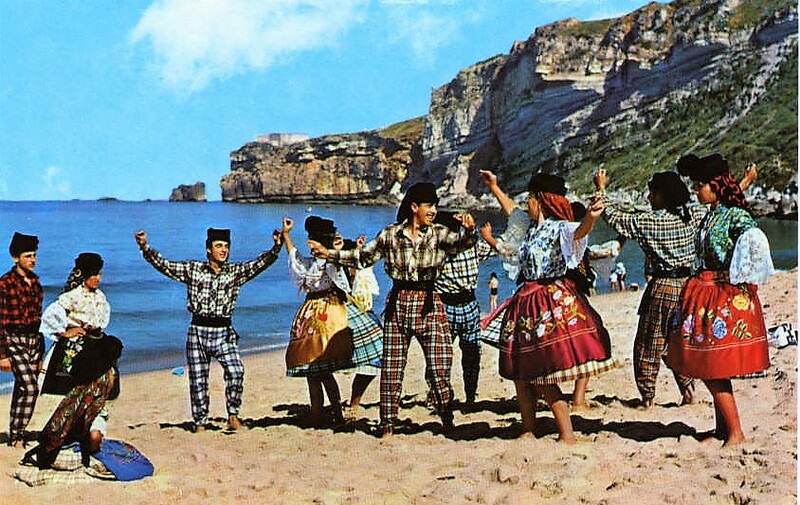 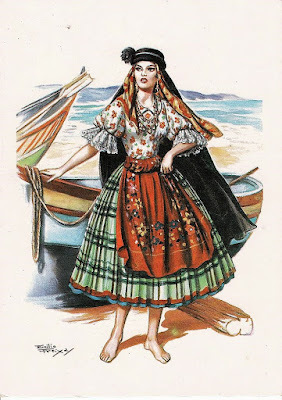 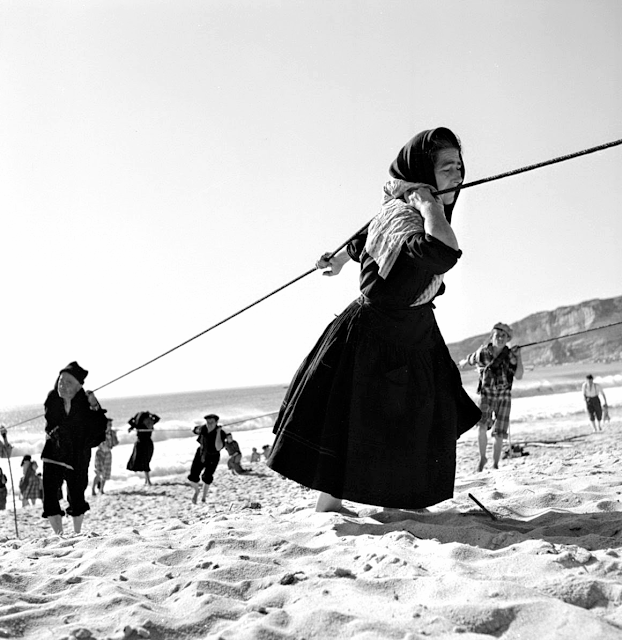 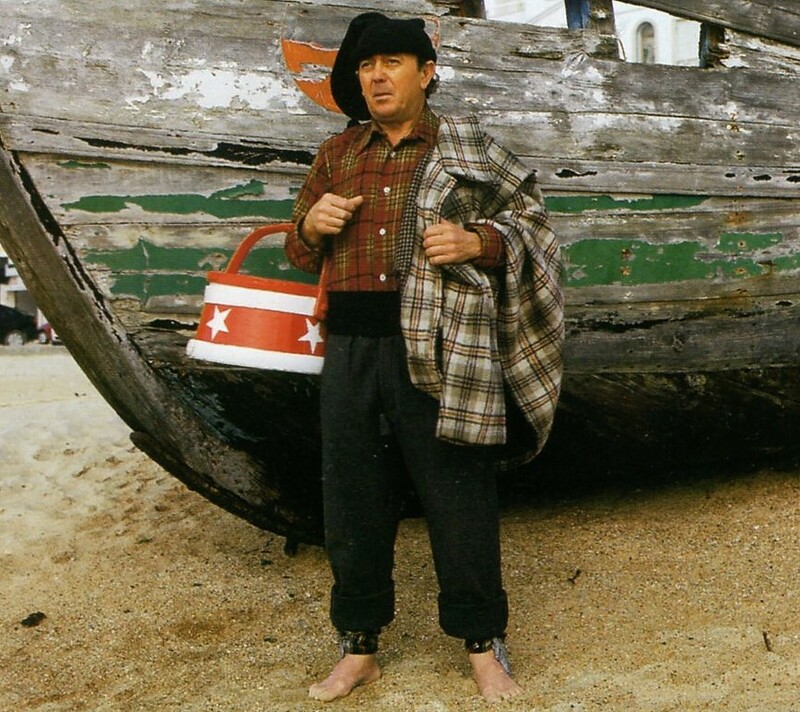 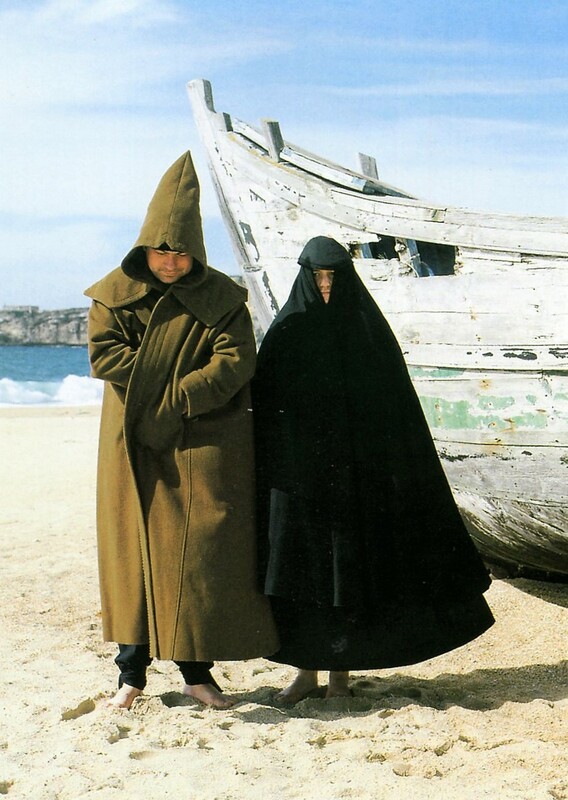 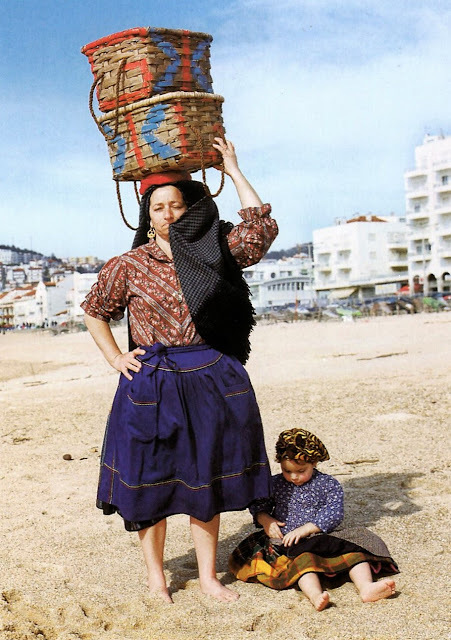 Here is the costume of the environs of Nazaré, which lies on the coast, some 120 km north of Lisbon. 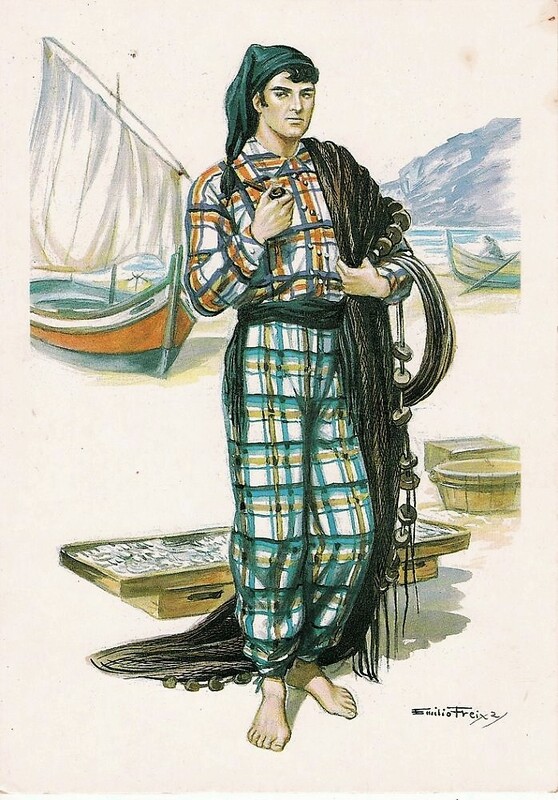 As you can see from the images above, this area is inhabited by fishermen who are partial to plaids. For women, the foundation garment is called Corpete. 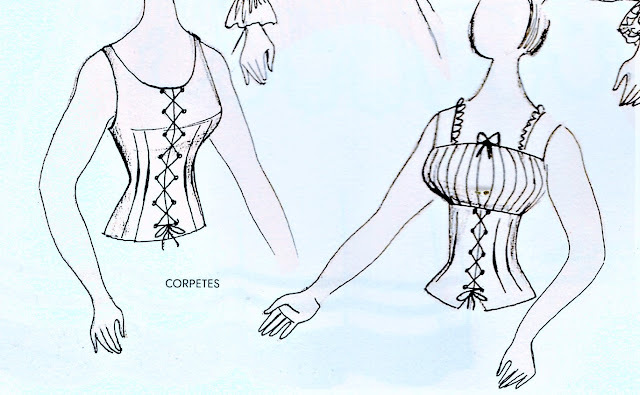 This is a type of bustier which is worn under the shirt and provides support. 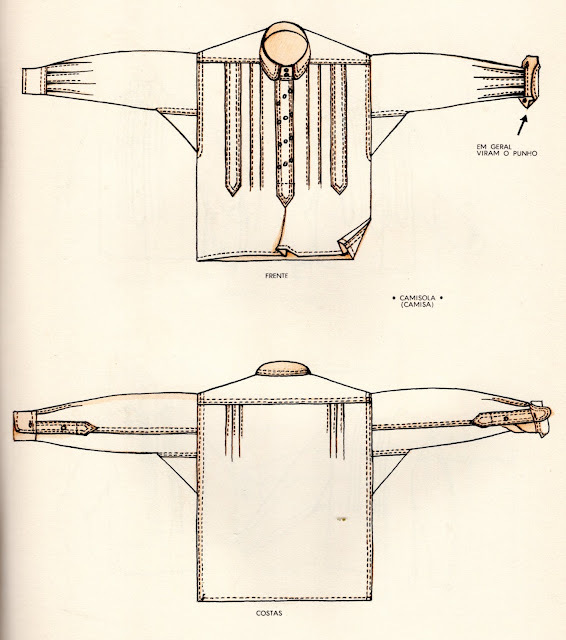 The one on the left was made of unbleached cloth, and worn with working outfits, and the one on the right was made of bleached white cloth and was worn with festive dress. 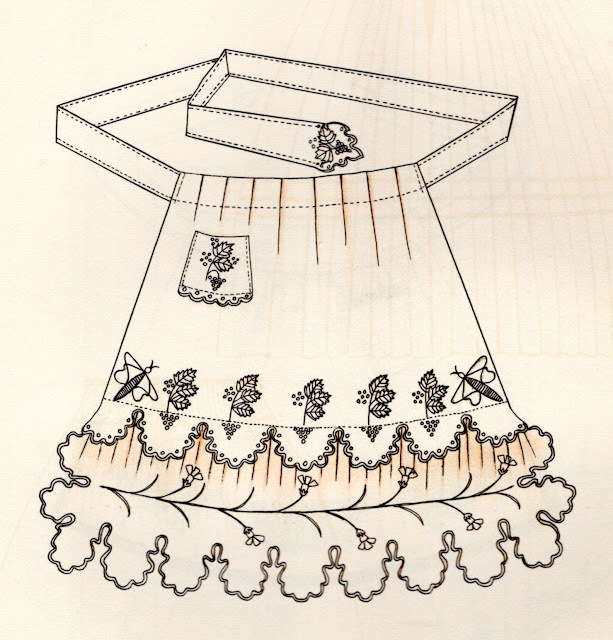 Over the corpete was worn the Blusa, or blouse. 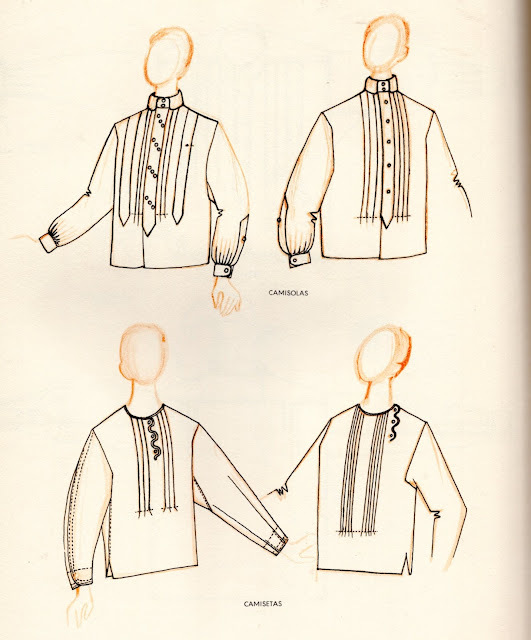 There are many cuts, but here are two typical ones.These two cuts feature a placket open down the front, and the second features a yoke over the shoulders. The bottom left shows a variant for sundays and feastdays, with extra lace. 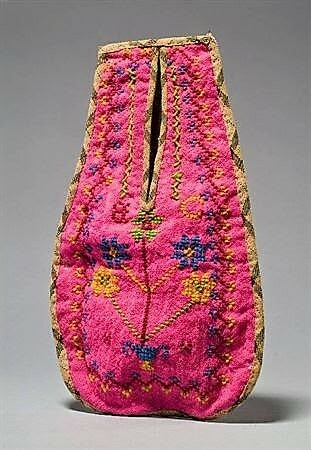 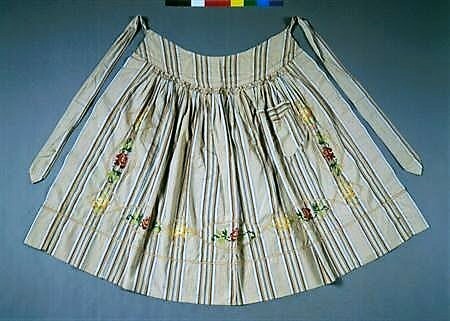 These were commonly made in calico. 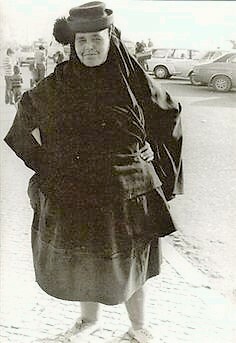 Here is a woman dressed for work. 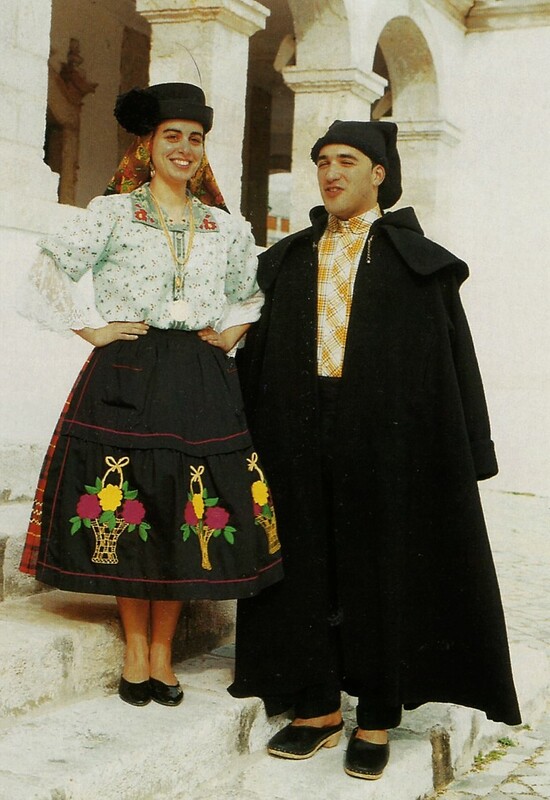 Here is a couple in festive dress. 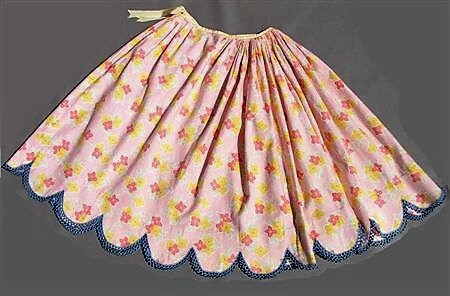 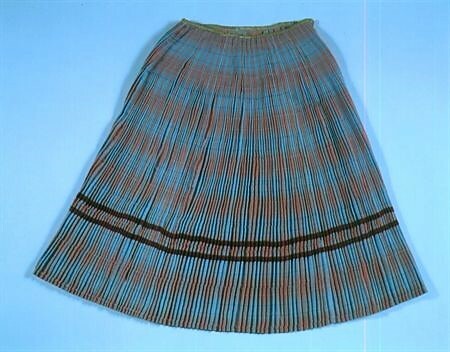 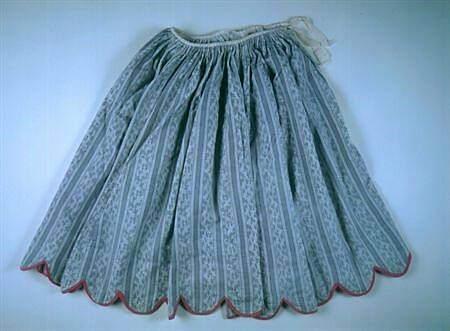 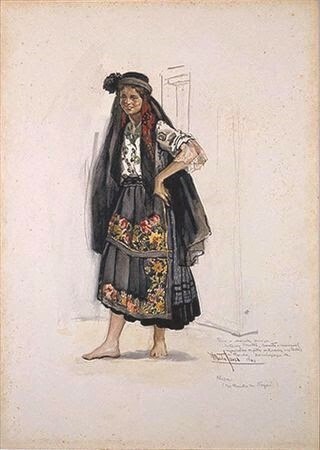 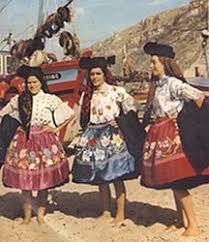 The skirt, saia, is very full, and worn in layers, the traditional number of skirts worn is seven, giving rise to the saying sete saias. 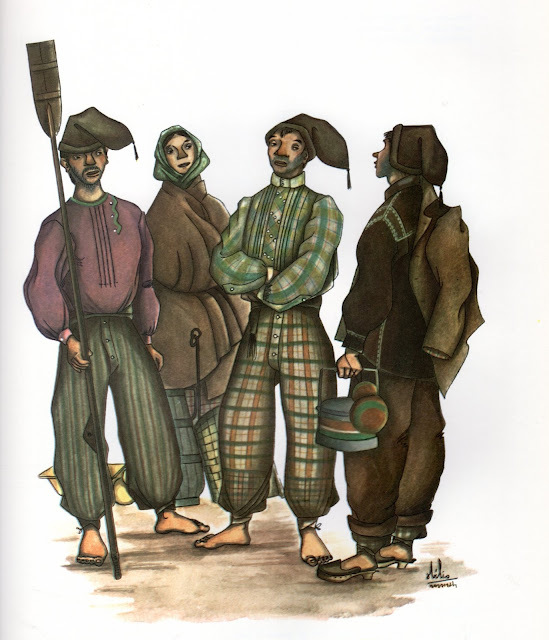 They are made of woolen beaver cloth, plaid, calico, or other cloth, being either gathered or pleated. 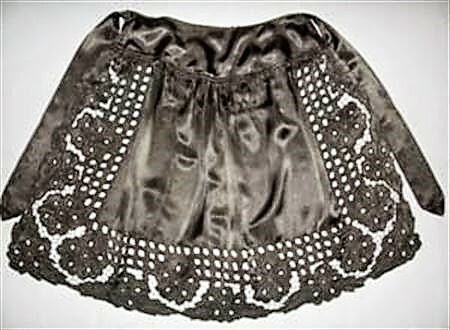 The dressier skirts are adorned with ribbon or bands of velvet. The hems were traditionally mid calf or so, but in recent years they have sometimes been made shorter, which is not a pleasing look, being out of proportion. 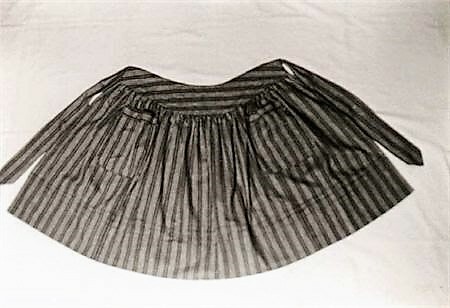 Recent dress clothing, showing absurdly short skirts, influenced by 1960's fashions. 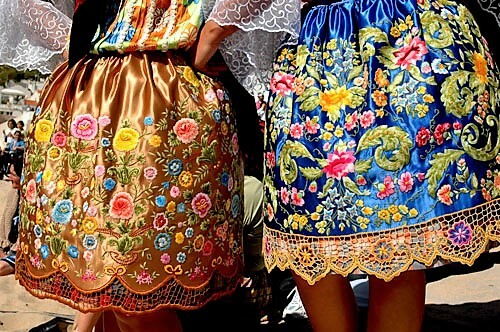 Not attractive. 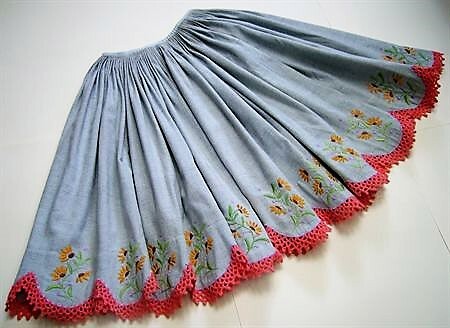 Examples of various skirts. 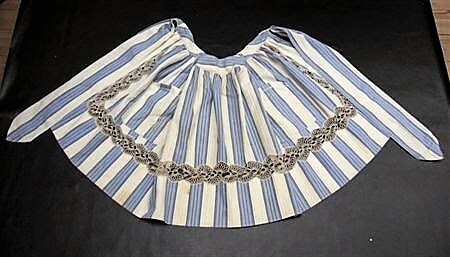 Note that some have scalloped hems. 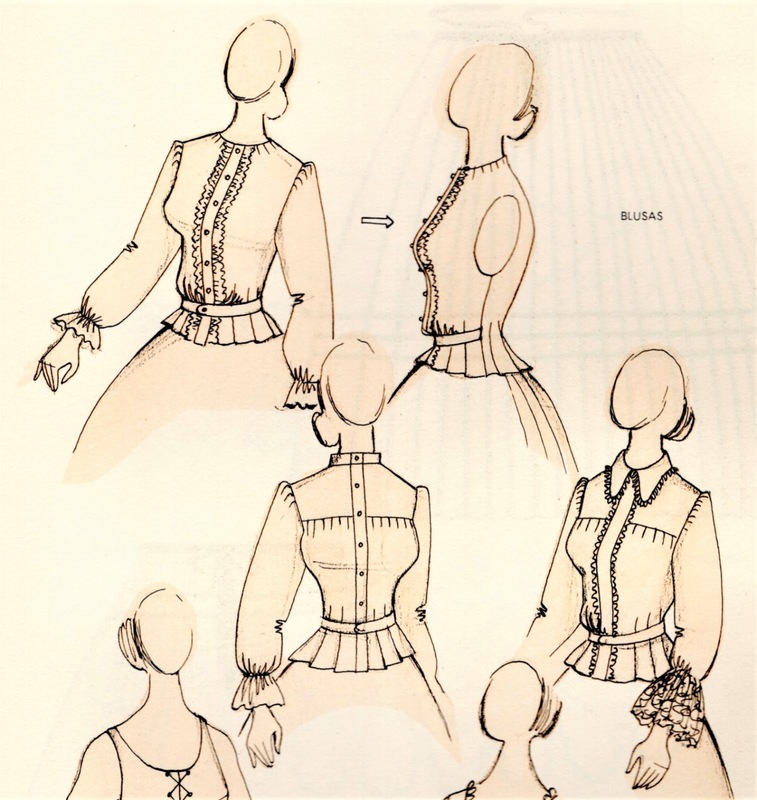 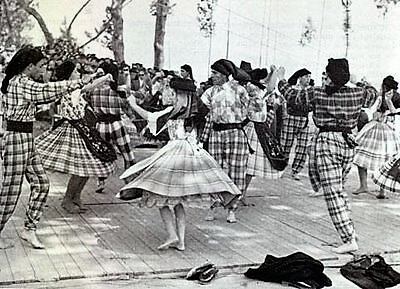 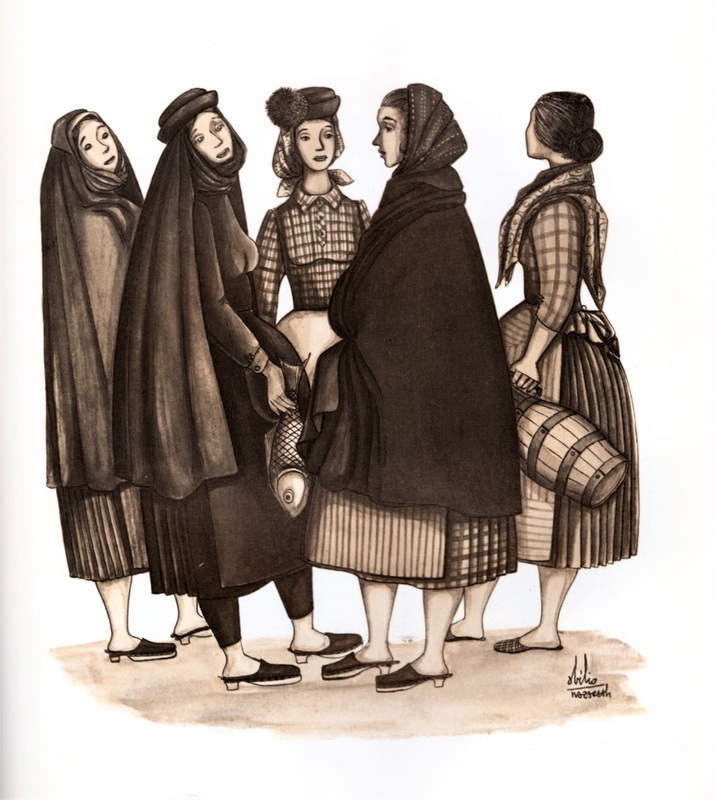 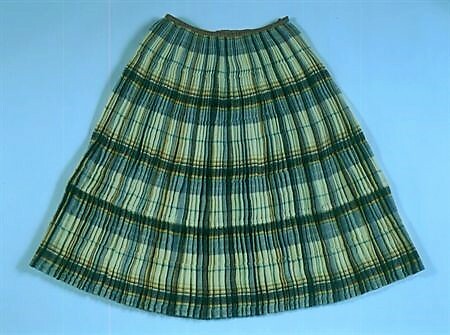 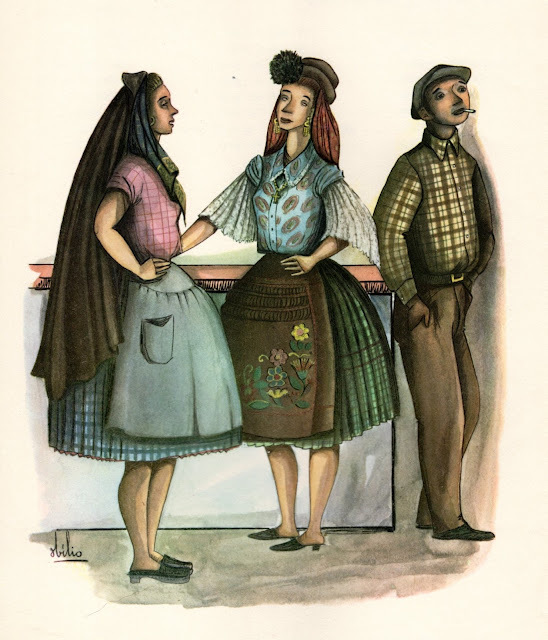 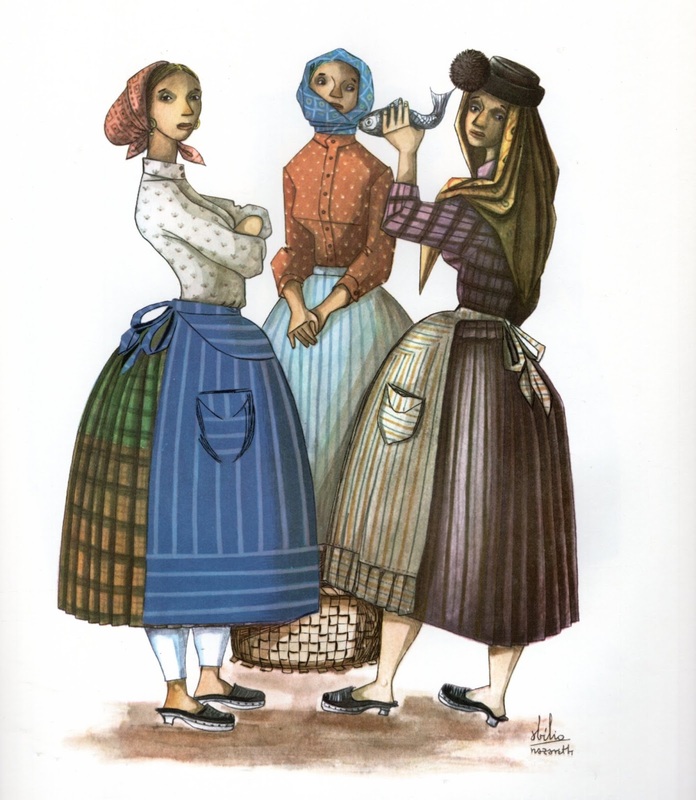 Many of the plaid skirts are made in two pieces, and some have embroidery near the hems. 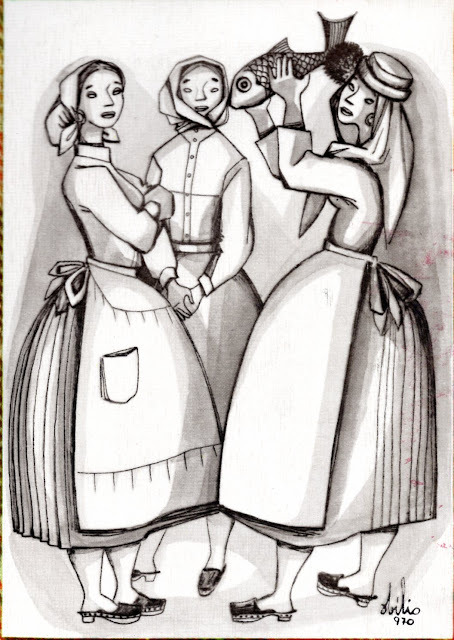 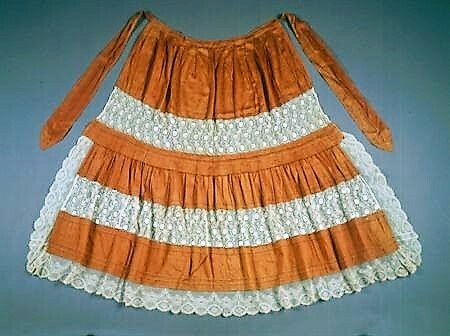 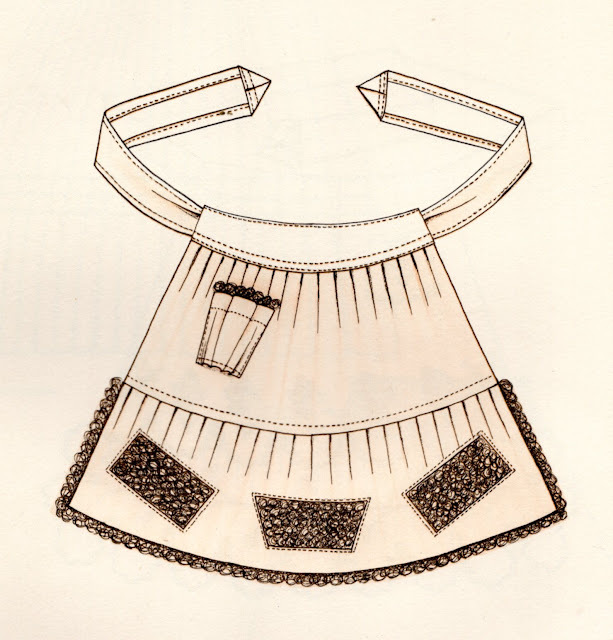 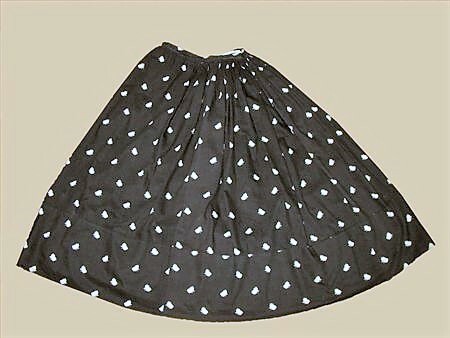 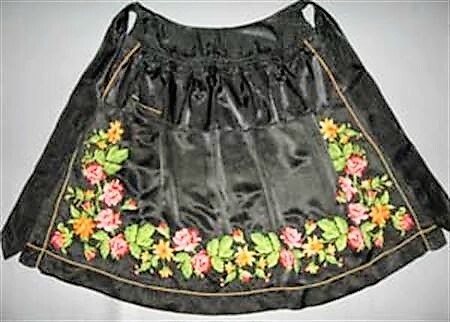 A loose pocket is worn under the topmost skirt, and is reached through the opening of the skirt, or worn under the apron. 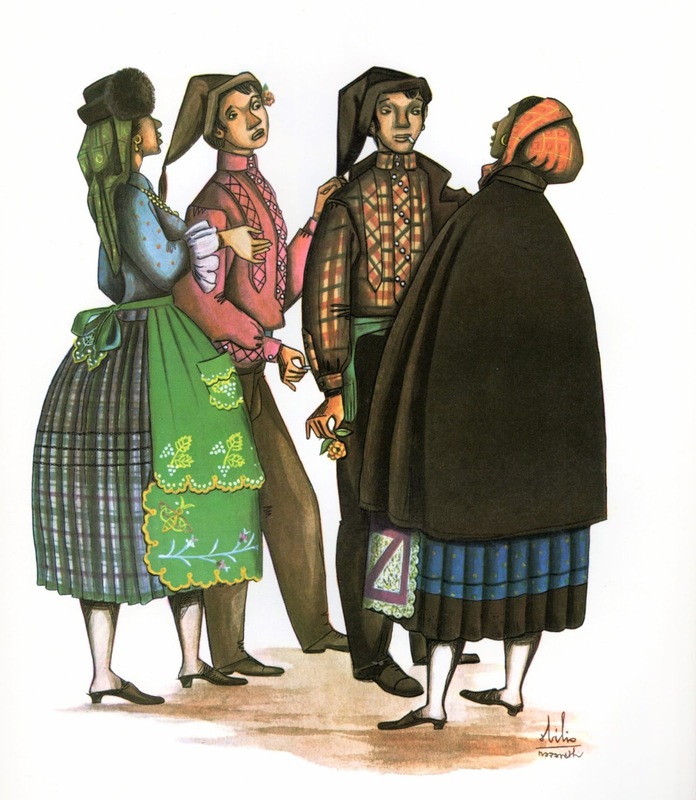 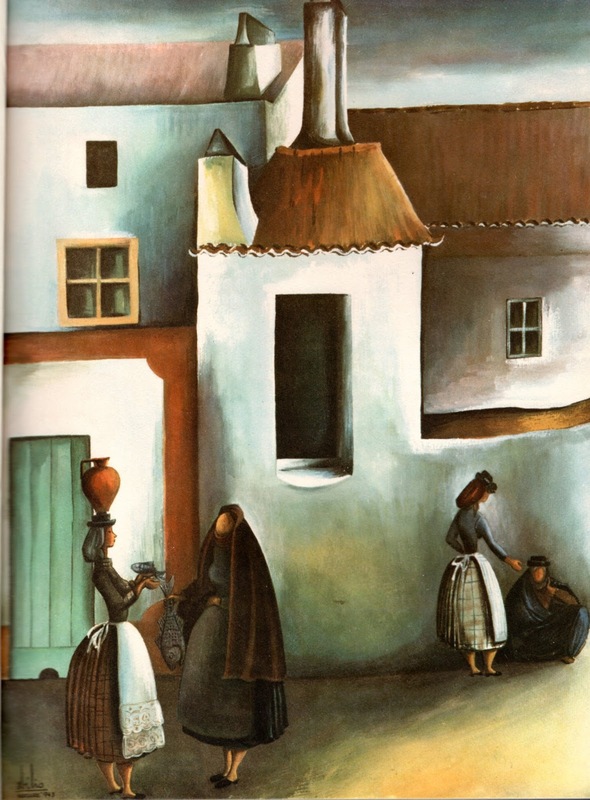 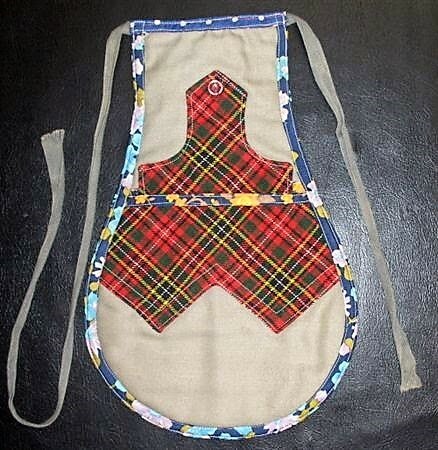 An apron is always worn, as with most folk costumes. 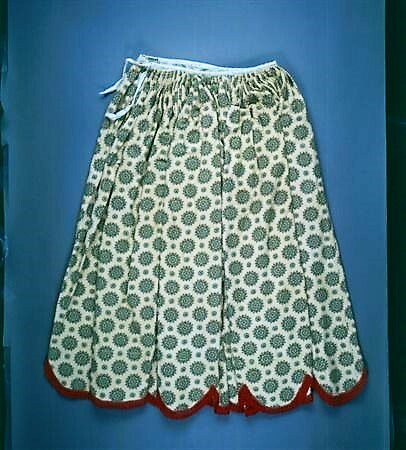 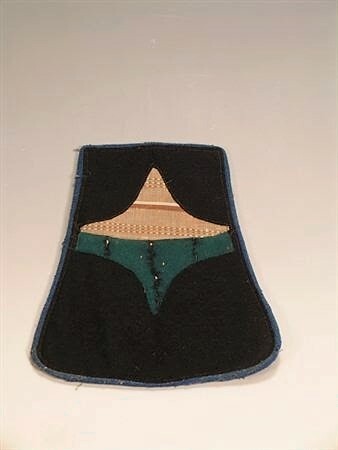 The waistband may have a curved line in front, approximating a semi circle. 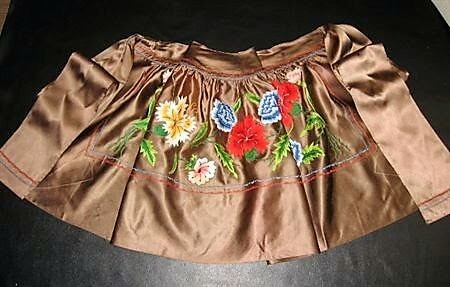 There may be a flounce. 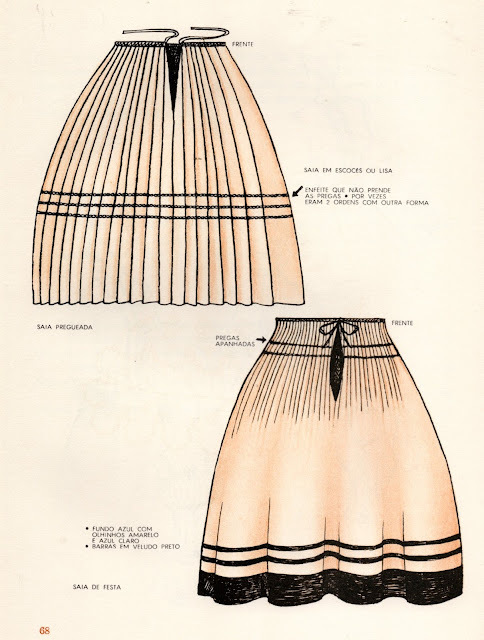 It is in many colors and types of material, plain, calico, stripes. 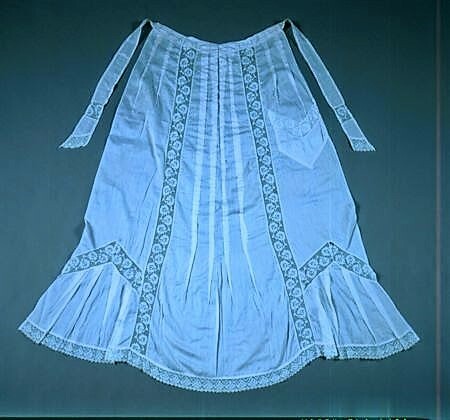 It may be ornamented with lace or embroidery. 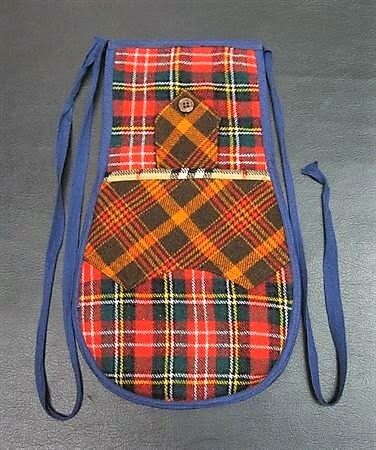 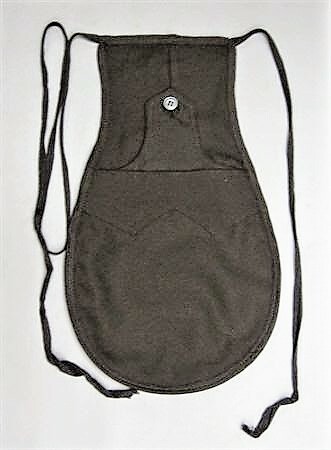 Working aprons often have a pocket. 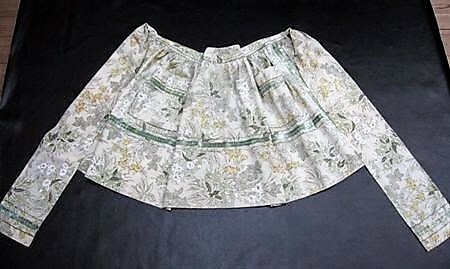 It is almost as long as the skirt. 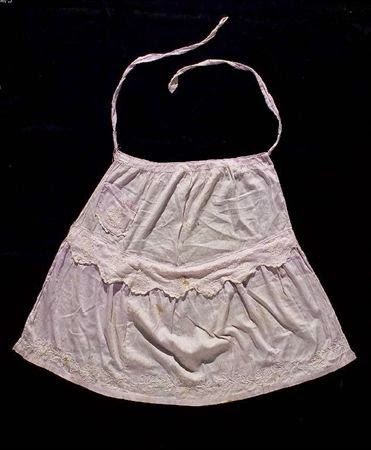 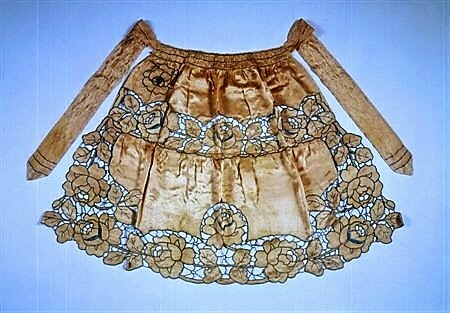 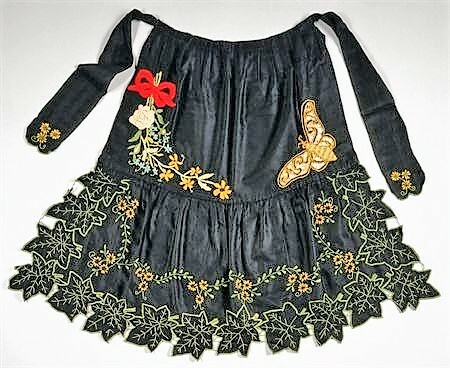 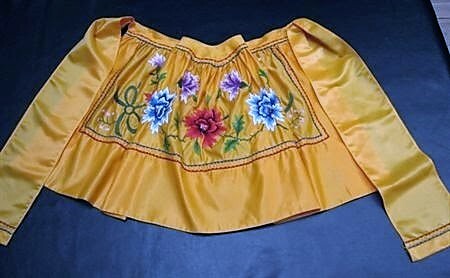 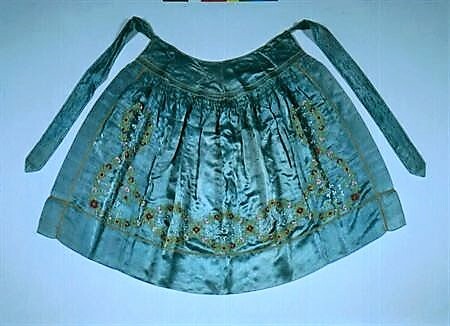 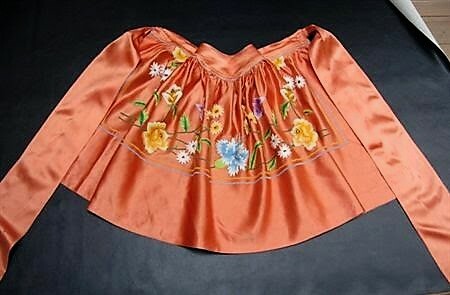 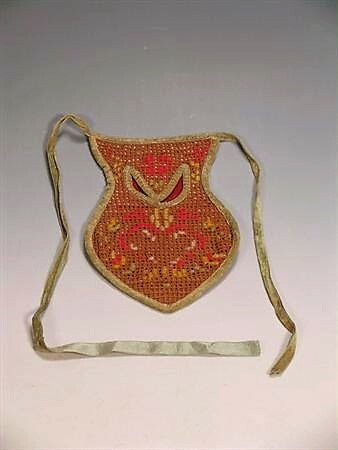 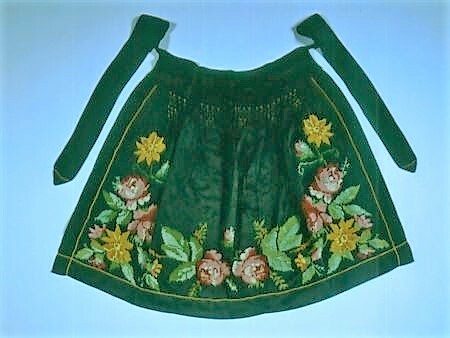 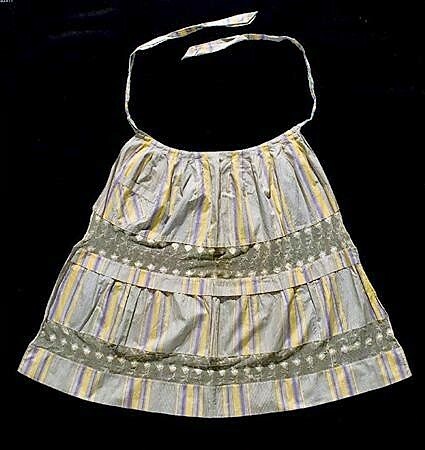 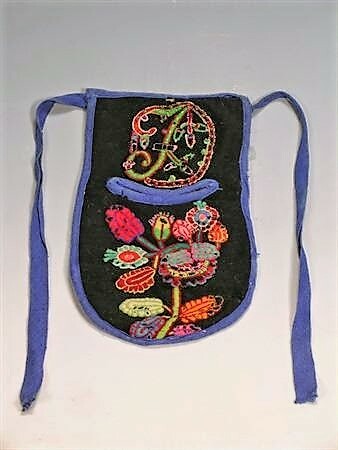 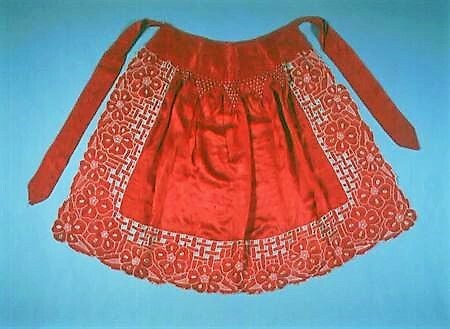 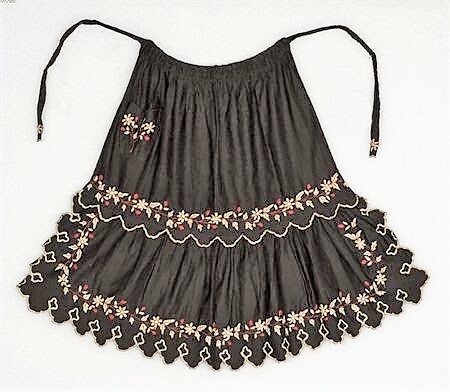 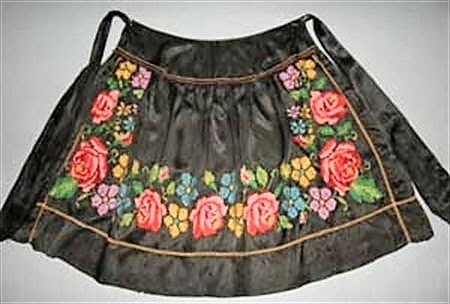 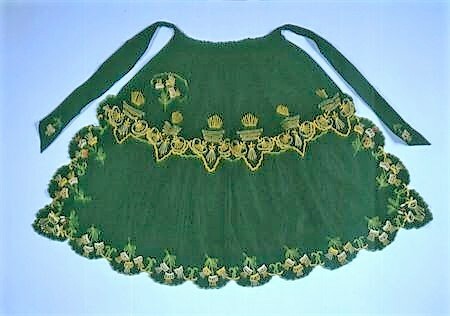 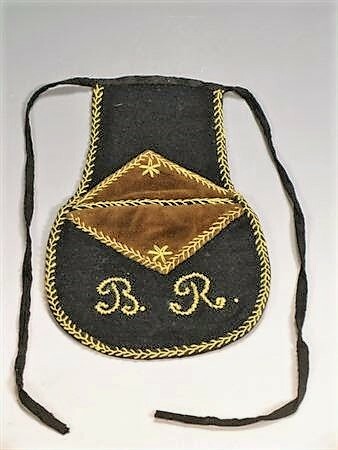 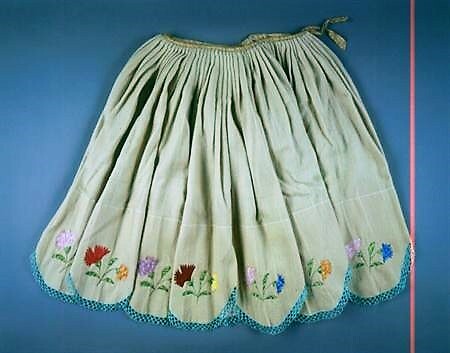 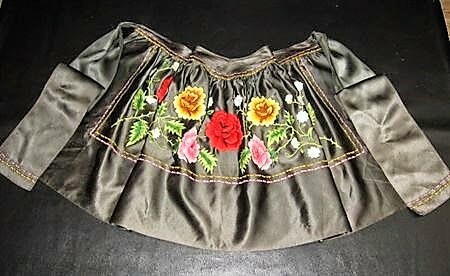 Dress aprons may be covered with embroidery. 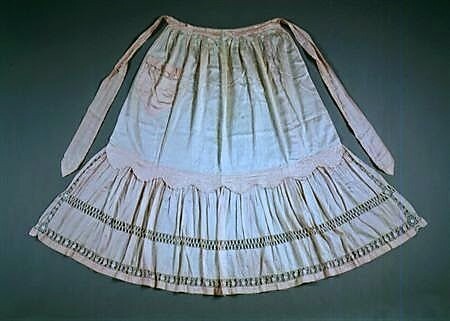 Those who make the skirts shorter also make the aprons shorter. 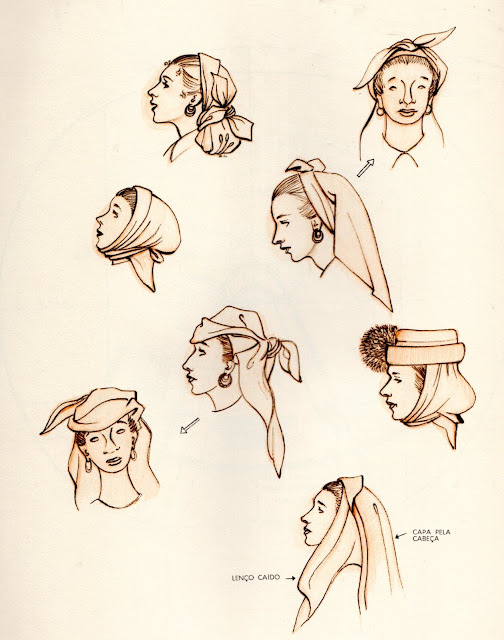 The head is covered with a kerchief, tied in different ways, sometimes crowned with a specific felt hat worn in this area, with a pompom on the side. 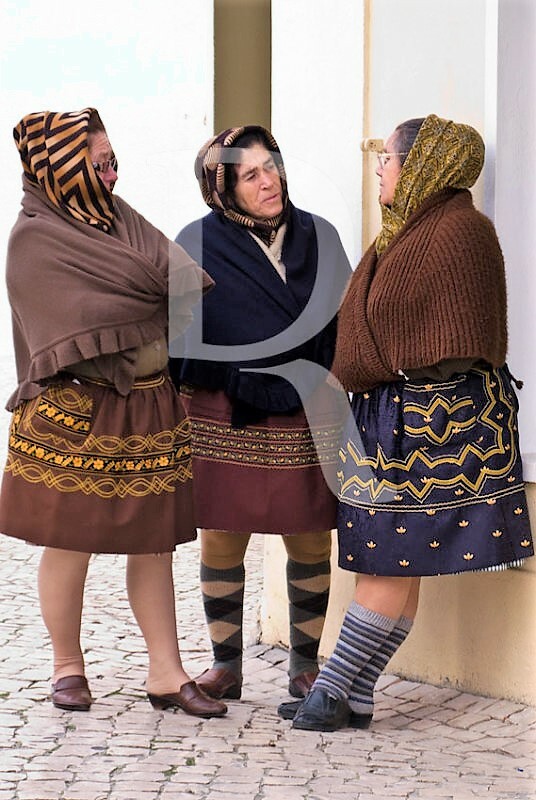 Stockings that cover the calf, polaina, may be worn, but they commonly go barefoot, or wear mules or clogs, depending on the occassion. 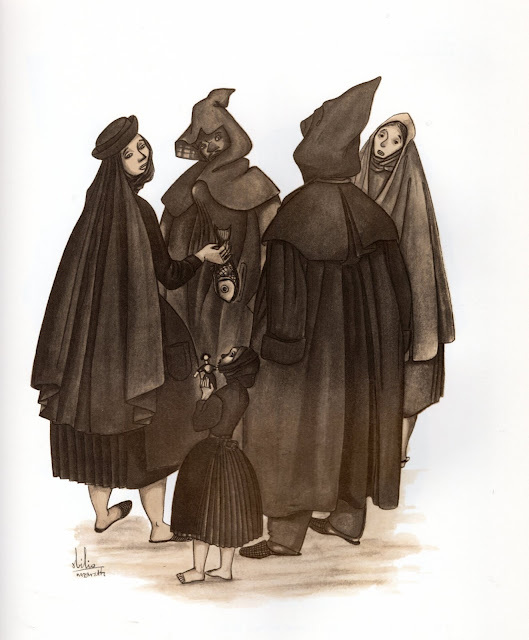 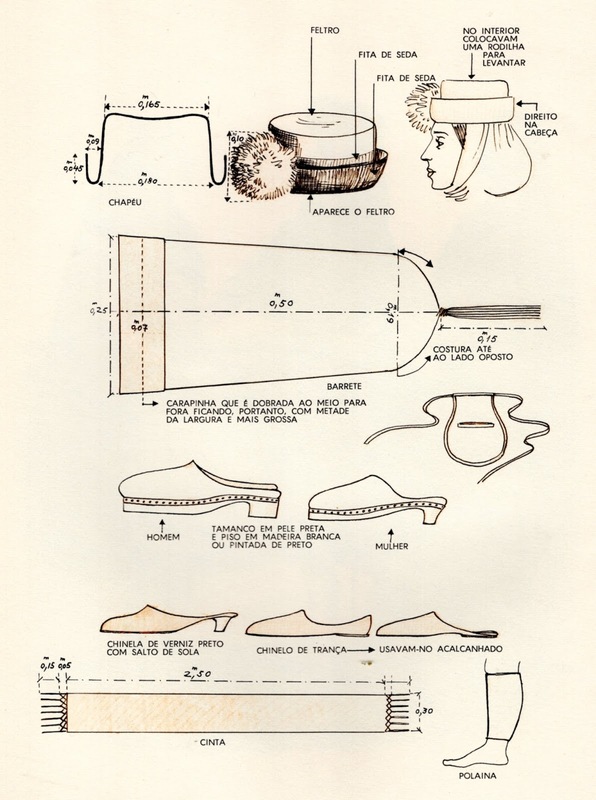 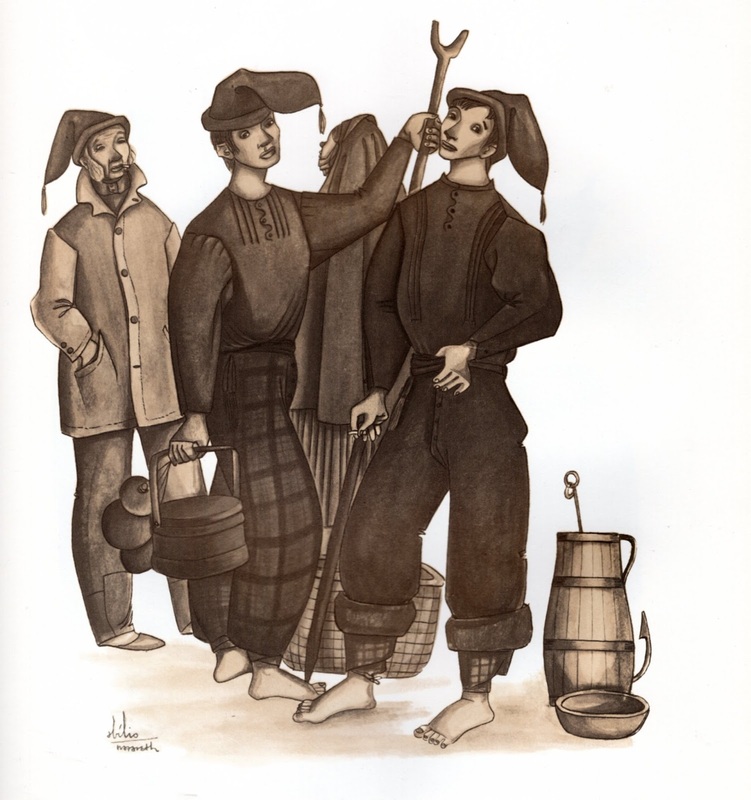 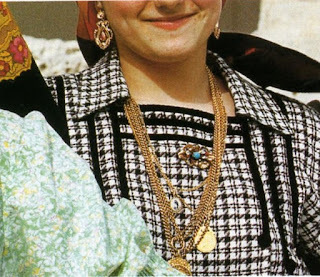 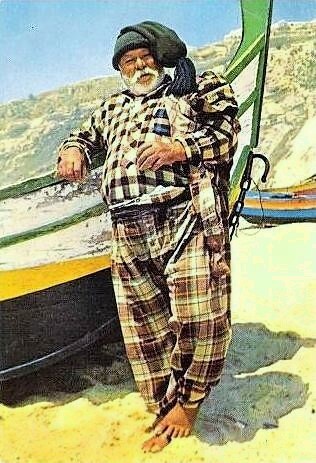 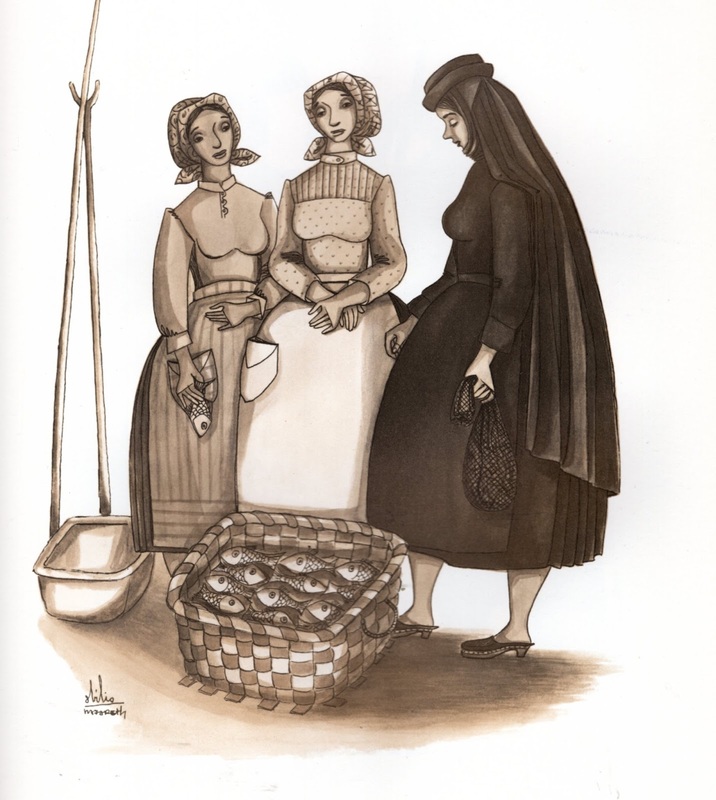 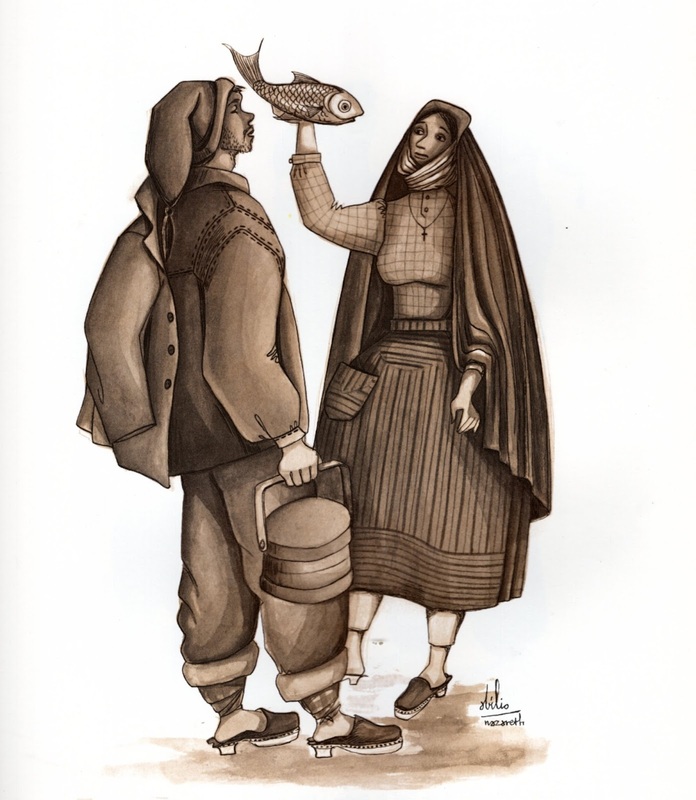 The above image also shows the men's stocking cap, which is similar to that worn by fishermen all around the Mediterranean, which also serves as a pocket. 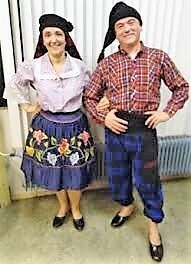 and men's clogs and sash. 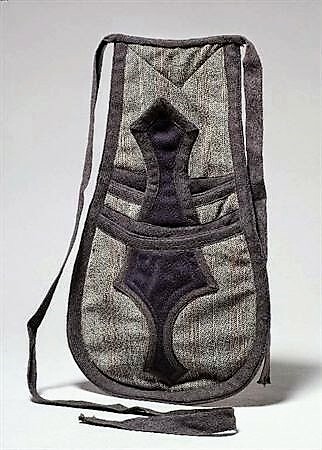 Both sexes at times wear a cape. 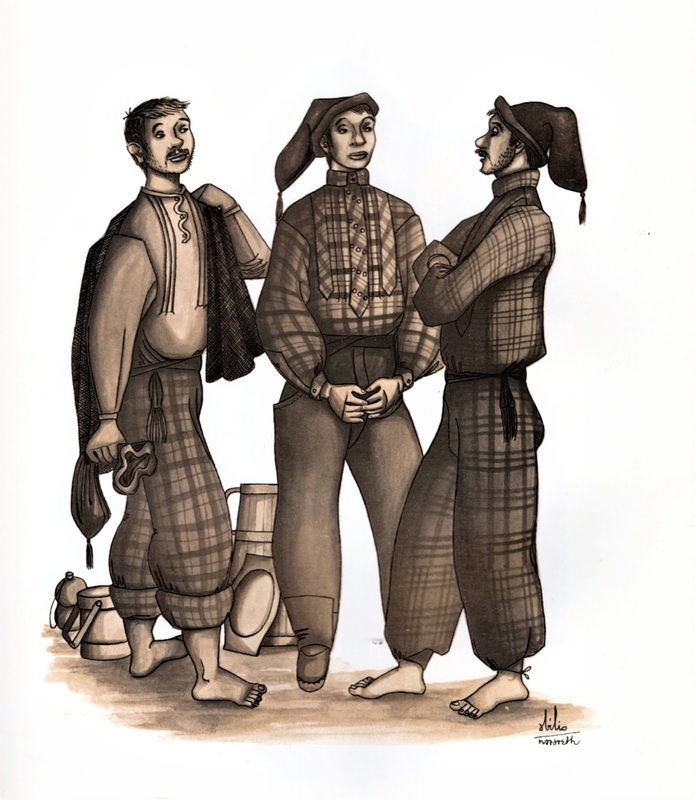 The men wear a shirt camisola, of heavy beavercloth, wool or plaid. Various cuts are used. Often in colder weather or when working on the sea, a second shirt is worn underneath of plain cloth, called camiseta. 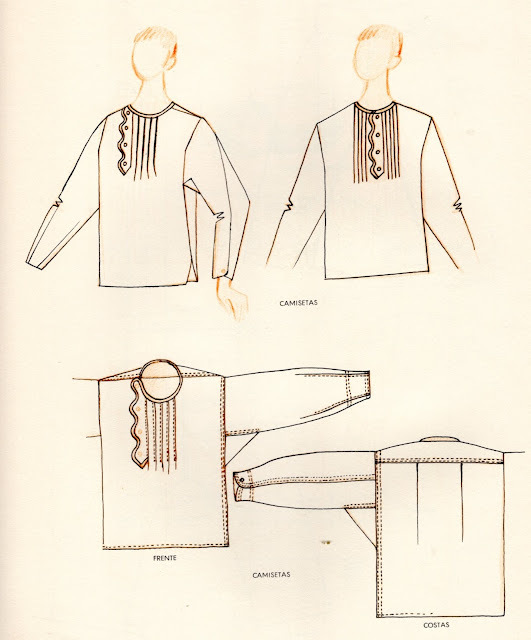 The camiseta only opens partway down the front, and is sometimes worn alone. 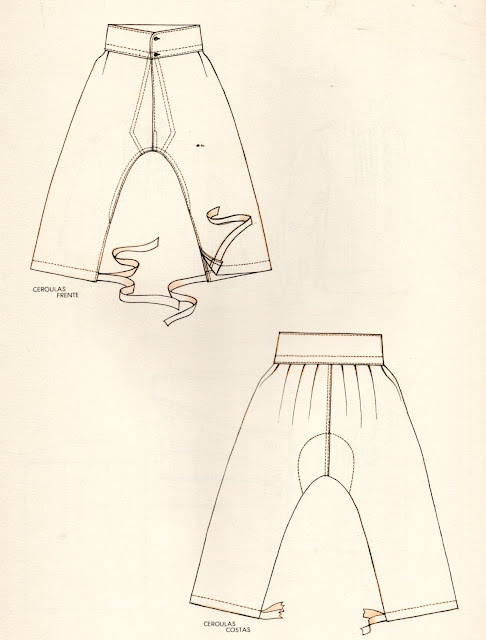 Heavy trousers are also worn, sometimes two pair are layed if need be. 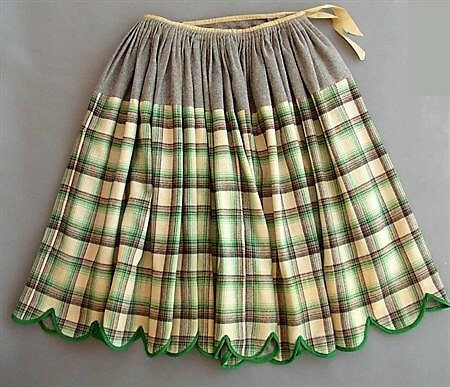 They are also of strong wool, beavercloth or plaid. 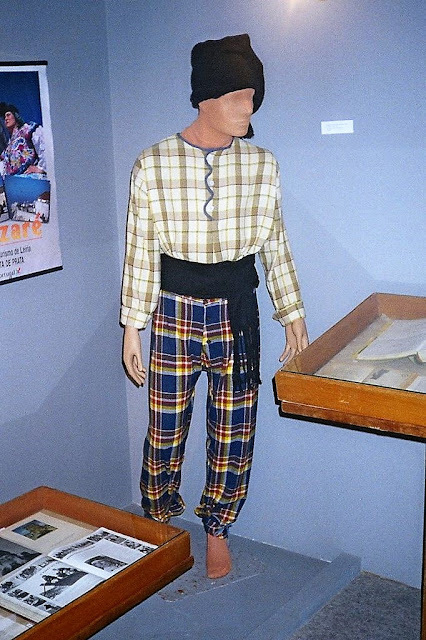 The shirt and pants are never made of the same plaid. 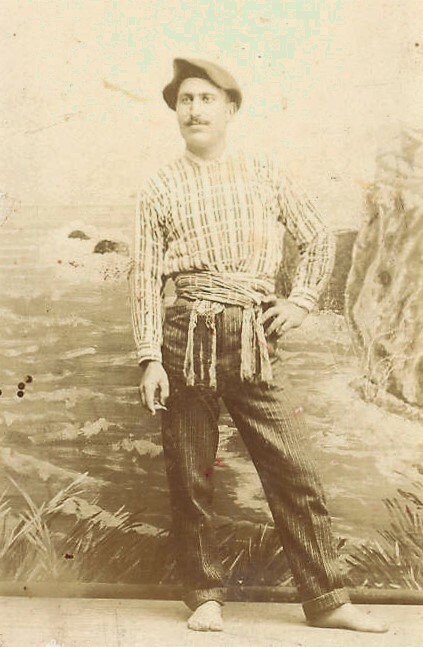 The cuffs of the pants are secured around the ankles with ties. 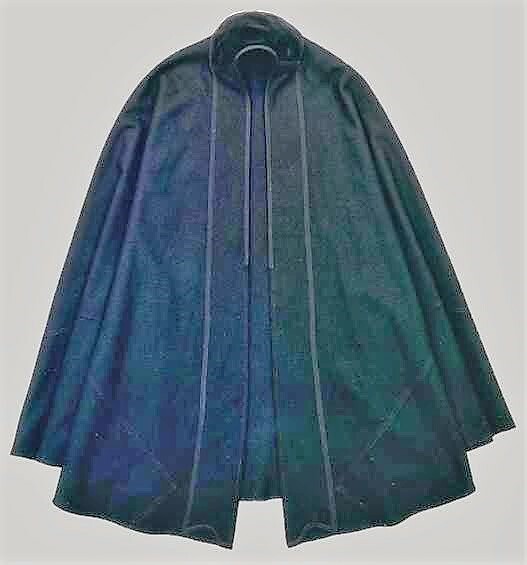 Heavy wool jackets are worn for work, capes may be worn for Church, Holidays or times of mourning. 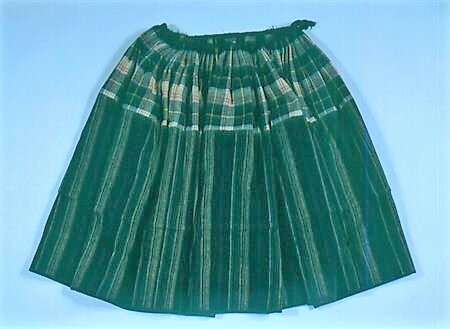 Plain black pants tend to be worn for dress,These are not bound at the ankles. 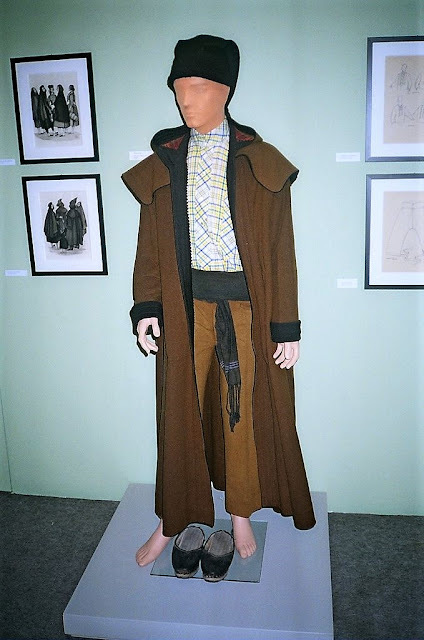 I will close with some more images of this costume. 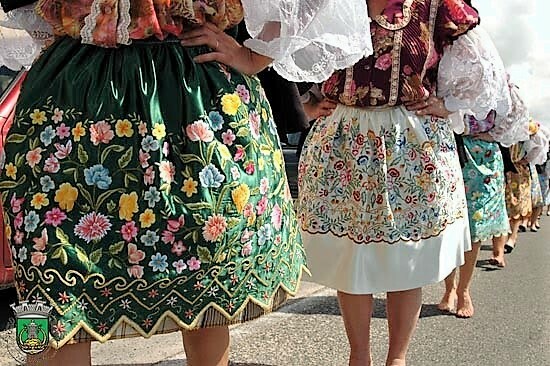 Some of them are of the excessively short variant. 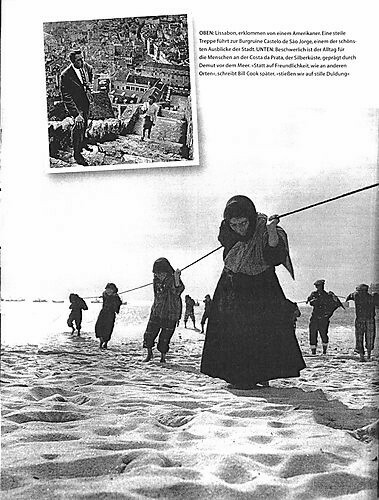 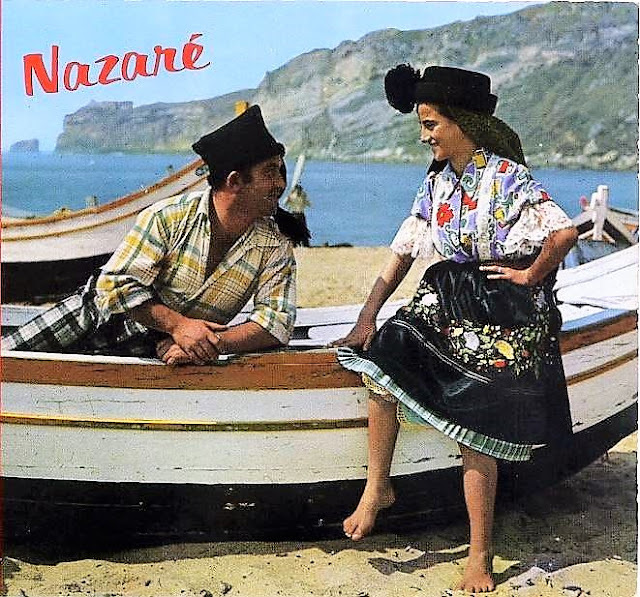 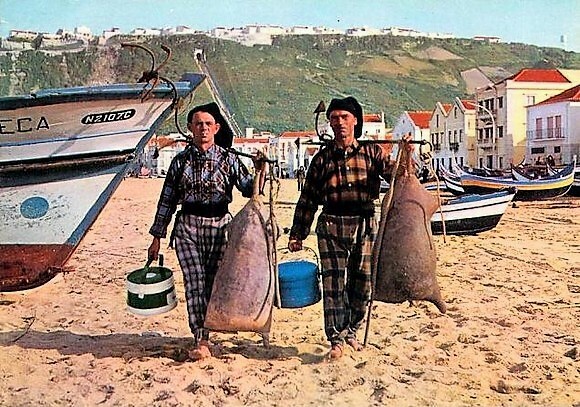 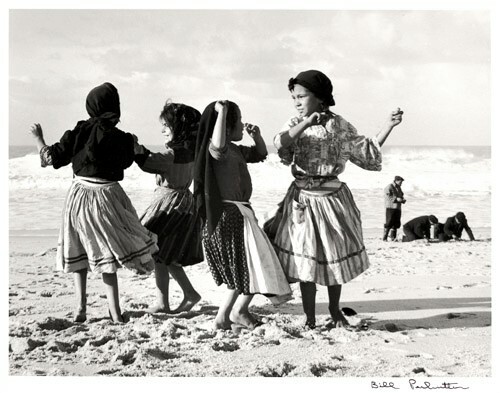 An old film showing Nazare culture. 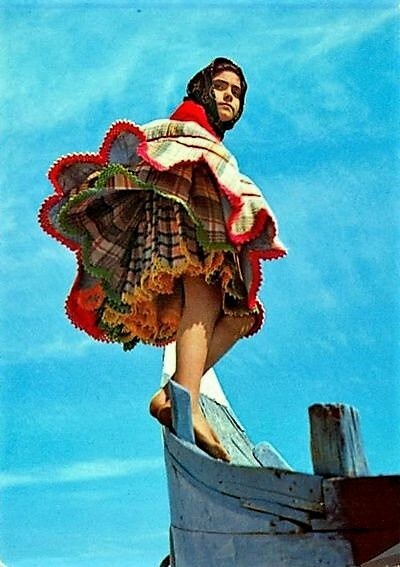 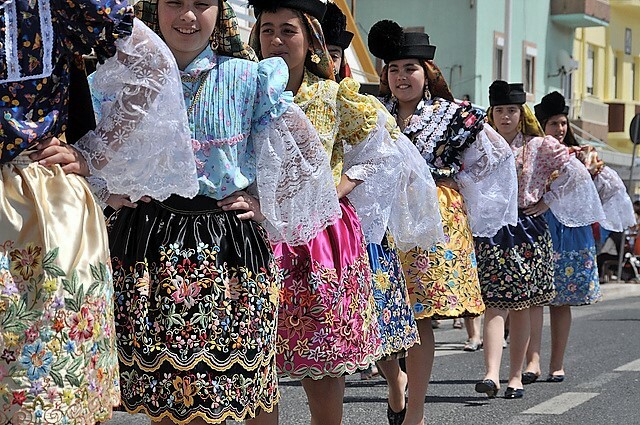 A cultural parade in Nazare, showing the short embroidered skirts. A stage presentation of Nazare culture, with very good costumes.